After leaving Muloorina we had a night at Leigh Creek to replenish supplies and update the blog, then off to Warraweena Station. 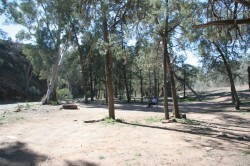 This is a private sanctuary in the Flinders about 30 Km north of Blinman. 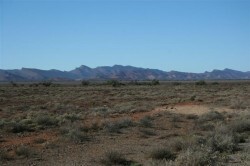 The station is 355 Sq Km and is managed by a wildlife trust to bring back the bush and the animals into the Flinders. 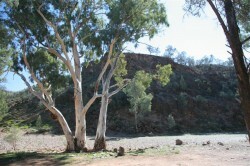 You travel from Leigh Creek via Beltana, which is an old railway service centre, which is now occupied by “new age people”. We thought the 25 Km road in was rough, until we tackled some of the roads on the station! Once you entered to station you noticed that there were may more small plants and the land was much greener than the surrounding areas. 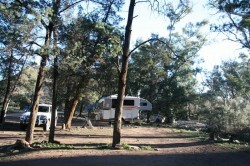 We had our own bush camp 2 Km from the station at the start of Sliding Rock Creek Gorge. The road in was stoney and along a creek bed for about half the journey. But well worht the trip, absolute privacy and your own long drop toilet (dunny). On the first day we set up camp and then walked up the gorge for a couple of K’s. Enjoyed the scenery, but no rock wallabys unfortunately. Marg also did some sketching, the views inspire you to try to capture what you see. The next day we went on one of the half dozen 4WD drives on the station to a gorge and waterhole and rock wallabys, hopefully. This one was rated as medium!! The screams from the passenger attest that it was a bit more than that. After about 20 Km we faced a steep creek crossing that had been washed out, Marg got out and walked over the creek and up te hill, I went through OK after dragging both ends of the Prado through. over the hill, we then faced 30 m of washed out track with two ridges on which to run the tyres (tyre width) and a half metre drop between them and on one side. The down side was too great, so we backed back up the hill and turned around. 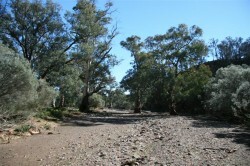 Marg heard a swosh-swosh as we backed and sure enough we had a flat (75 mm slashed wall from the creek crossing). So back to camp we went, fairly slowly as we didn’t fancy a long walk! Having had enough outback adventure over the last few years we decided to head home, especially as Marg has had bad asthma in the cold nights, because she cannot breath deeply with her cracked ribs. This causes a build up of congestion which can lead to pneumonia if it builds up too much. It will also be good to be back as Deen is having some minor surgery this week and we will be there to help if needed. The drive down the Leigh Creek Road on the western side of the Flinders is Marvelous, the ranges stretch into the distance alongside te road all the way, you want to stop every K or so and take another photo. Last night in Burra, a great town and worth more than an overnight stop. Tonight in Ouyen and then home.